Oa woodworking project, either through concept sketches or from measuring an existing piece, the next step is to create a bridge between the idea and the actual construction. This means defining your vision on paper with working drawings, usually a three-view (ordiographic) projection (see "OreatingWorking Drawings," pp. 47—52). I use these drawings to generate a bill of materials, which functions both as an order sheet and as a data base from which to develop the cutting lists—one for solid stock and one for sheet stock, if any. These lists show the number, the size, and the detailing of every piece of wood that goes into the project. Sometimes I also make graphic representations of the cutting lists to help me determine the most efficient use of the stock. Last, I cross-check carefully from the drawing to the bill ofmaterials to the cutting lists to make sure that they all agree. Once you have accurate cutting lists in hand, you can begin the actual construction process by laying out the components. When all the parts are marked on the stock, it's clear sailing;—no more knitted brow and clenched teeth.You can leave behind all that left-brain, analytical thinking and enjoy the process of cutting, shaping, and assembling the components. To ensure that all the parts of a project will be accounted for in the bill ofmaterials, and later in the cutting lists, create a referencing system. On the three-view drawing, label each component with a circled letter. You needn't bother to label separate identical components, such as four legs of an end table (as long as they're all made from the same material).To make organizing the bill saner, especially with large, complex projects, label the largest components first, working your way down to details such as moldings and drawer parts. Be sure to place material under the appropriate stock heading—solid or sheet—and add a notation for species if you're using more than one kind of wood. As you list each item in the bill ofmaterials, add a second circle around the letter on the drawing.When all the letters are double-circled, you'll have accounted for every component. Double-check by comparing the number ofitems on your bill of materials against a count of components shown in the drawing. FROM THREE-VIEW DRAWING to bill of materials to cutting list, step-by-step organization can all but eliminate measurement errors. By taking care of the calculations and accounting up front, you can concentrate on attaining accuracy and perfecting technique. A POUNCE WHEEL IS USEFUL for transferring layout information either directly to the stock, if you only want one piece of that design, or onto template material, such as '/.-in. lauan plywood or Masonite, if you want a more permanent record to reproduce the piece later. whe n joining boards with tongues and grooves. Ifyour three-view drawing does not specify the sizes of these joint s, lay them out on a full-scale drawing. Unless you note otherwise, assume that the length of ihe components runs with the grain of the wood. BENDING A BATTEN TO points along a curve is the best way to lay out long, gentle curves. For fair curves, use a square batten. Develop the culling lists directly from the bill of materials, collating the components by function and then by dimension. 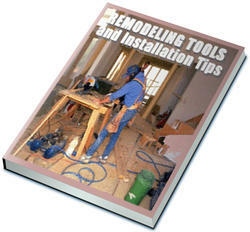 Establish a heading for thickness first, and then create subsidiary columns for each width (see the photo on p. 65). Under the appropriate width, write in the length of each piece. Iflhe components aren't simply square-sided (without profile), add a cross-sectional graphic next to the length. If there are a number of identical parts, make tick marks to the right oflhe length to indicate how many. Don't confuse yourself with numerals here. As with the bill of materials, list the largest pieces first, double-circle the letter symbol on the bill once you transfer it to the culling list and double-check by comparing the number of components on your bill of materials and culling list. If] have a lot of components to cut out ofsheet stock, 1 make a graphic cutting diagram (scaled drawings of 4x8 panels) on which 1 juggle the layout oflhe components to get the most out of each sheet. 1 account for sawkerfs, and 1 pay attention to grain by book-matching pairs of doors or cutting a bank of drawer faces from a single section of a sheet, for example. To make the panels easier to handle, 1 try to arrange the components so that the first cuts are full-length rips, giving me lighter stock to deal with when crosscutting. With die cutting lists completed and double-checked against the bill of materials, you're ready to lay out the components on the boards. As you bring each previously thick-nessed board to a leveled pair ofsawhorses, set them down so that most defects face up. Maik die locations of any defects from die underside oflhe board onto the visible face widi chalk.Always "waste" a minimum ofan inch at each end ofa board when squaring it, and lake off more if splits are obvious. Mark points A and ES. where the arc leaves the stock, and draw a line indicating the height of the arc. Swing compass or trammel from points A and B. both above the height of the arc and below the stock, on an extension board. 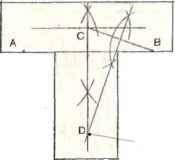 Draw a line through the points defined by the intersection of the compass or trammel beam swings. Point C is the apex of the arc. Repeat steps 2 and 3. except swing from B and C instead of A and B. Where this new line (perpendicular to the segment between B and C) intersects the line you drew in step 3 is the pivot point for the arc you wish to draw. Set compass or trammel to the distance between D and A (or B). Swing arc through A. B. and C.
If the board rocks on the leveled saw-horses or bows significandy, it's probably best used for short components. Try to lay out components to make the most efficient use ofa board. Work around knots and other defects, keeping an eye out for grain matches and striving for an overall pleasing look for the visible faces ofa project. Finally, try to arrange the layout so the off cuts are long lengths', shorter, wider offcut pieces generally make less useful stock for future projects. Use a piece of chalk or a timber crayon to mark out the pieces on the stock. Lay out pieces X in. long at this point and at least Xr. in. wide. It's easier to remove wood later than it is to add it back. Leave pieces even wider ifyou know the stock tends to curve as it's ripped. As you locate each component on the boards, pencil in a tick mark to the left of the length notation on the culling list. When the tick marks on the left equal those on the right, all the pieces oflhis width and length have been accounted for. LAYING OUT ROUND CORNERS is easy with marking gauge and compass. Set both for the same radius, mark intersecting lines with the gauge, and you have a pivot point. liable, there's no need to transfer the layout from the graphic culling diagram to the stock. Simply set the rip fence or stop on the crosscut box to the measurements on the cutting list, and make the cuts. Label each component along an edge with a marking pen, and put a second circle around the symbol denoting that component on the cutting diagram. there's a chance I'll want to make a piece again, 1 make a template; if] know a piece is a one-off, 1 just pounce onto the stock. To transfer the shape of a complex or irregularly shaped component, such as a scalloped table apron, 1 always use a full-scale template. To make the template, 1 tape vellum tracing paper (available at art supply stores) over the area of the full-scale drawing containing the component and trace its shape with a #2X pencil.Then I pounce the pattern onto a piece ofX-in. lauan plywood. 1 handsaw this pattern to within 'A<, in. ofthe line, and then use rasps, files, and sandpaper to finish the job. 1 can use this plywood pattern to reproduce the component indefinitely. A set of templates representing each component contains all the information I need to reproduce a project; it's a durable, accurate and highly efficient way to keep this information at hand. To draw a fair curve, whether on a full-scale drawing, a template, or directly on the stock, use a batten held to a series ofpoints along the curve (see the bottom photo on p. 66). 1 make battens from clear, close-grained wood. Old-growth fir or spruce is ideal, though nearly any knot-free, straight-grained stock will do. Cut the batten square to keep the curve fair—from 'A in. for tight bends to X in. for long, gende curves. To determine a few points along the curve, draw a ] -in. grid pattern over the area ofthe full-scale drawing containing the curve. Draw the grid on actual stock or on template stock. Determine where the curve intersects the grid lines on the drawing, and transfer those points to the grid on the wood. When working from a scaled drawing, draw the grid on the drawing at the same scale, lay out the curve at scale, and transfer it to the wood. 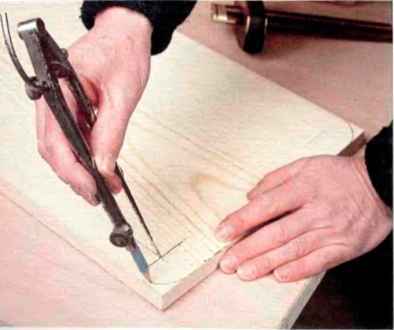 AN EFFECTIVE AND CHEAP centering scribe can be made from a piece of scrapwood, two dowels, and a drywall screw, as the author demonstrates above. CENTERING RULES AND REGULAR RU1F'- are both useful for locating centers. They can also be used for establishing regular Intervals across a board's width. the stick from breaking by applying the bending force from near the end of the batten rather than just beyond the points you've marked. Where necessary, sandwich the stick between two nails to hold it in place. 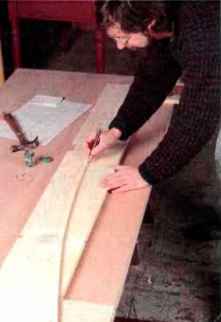 At the ends of the curve where the batten leaves the board, add extension boards to which you can fasten the free ends ofthe batten. Don't let the protruding ends just run straight.That would cause the curve on the board to go out offair between the points marked on the stock. Before drawing in the curve, eyeball it. You can readily see if it's a sweet, fair curve. Don't hesitate to let your eye overrule a marked point to make it fair. |f a curve is nothing more than an arc (a portion ofa circle), you can use a compass or a trammel beam to draw it. The only trick is finding the center ofthe circle—the pivot point for the compass or the beam. It's not difficult to do, but it's not exactly intuitive either, hearkening back to high school geometry, which may not be all that fresh in your mind anymore. Figure 1 on p. 67. Unofficially I draw in rounded corners by reaching into my pocket, taking out a fistful of change and using a coin as a round template: A penny produces a X-in. radius arc; a quarter produces about a X-in. arc and a half dollar gives you a X-in. arc. For larger radii, I've even rummaged through my finish supplies for cans with a radius close to what I wanted. Officially, and when I'm out of change or fed up with using out-of-round cans that leave a ring of old paint or oil on the wood, I use a marking gauge and compass to draw in a rounded corner quickly and accurately. I set the marking gauge to the radius I desire and run the gauge along each edge ofthe wood to the corner. At the intersection ofthe lines, 1 place the pivot point of my compass, which I've set to the same radius as the marking gauge, and I draw in the rounded corner. Sometimes, when laying out a piece offur-niture, you need to divide a board into parts of equal width, whether halves, thirds, or more parts. Centerlines are often needed to locate joint cut lines or assembly positions. Multiple divisions are needed to locate the parts of certain joints, such as dovetails. Components that are to be located evenly between two points, such as chair slats, must be laid out so they end up with equal spacings between them. The process can seem complicated, but with certain layout tools and just a little bit of arithmetic (the first and only rime I'll burden you with number crunching), these tasks can be made a lot easier. The simplest way to find a centerline across the width ofa board is to use a centering rule, a rule that reads both to the right and to the left of a 0 at the center of the straightedge (see the top right photo on p. 70).To find a center point, you need only position the rule so that the same number appears over each edge, and the 0 will indicate the center point. If components are centered on equal division lines, spacing won't be equal. Spacing between posts and outermost slats (end spacing, or ES) is determined by subtracting half the width of one slat from the spacing determined with the above formula. A standard rule can be used to locate any n u m b e r of equal divisions across a width. Let's say that you want to divide an 1 1-in. board into four equal pieces. To do this, lay the rule on the board with the 0 point over an edge.Then set the 12 (a multiple of4) on the other edge of the board (see the top right photo on p. 70). In most cases, you'll have to angle the rale to do this. Now just mark your division lines (here, 3,6, and 9), and then extend or transfer them, using a marking gauge (or a combination square if the end of your board is square). To draw centerlines over the length ofa piece of stock, I made a simple centering marking gauge, consisting oftwo dowels, a little block ofscrap and a common drywall screw (see the top left photo on p. 70). When using the gauge, it's important to keep the dowels tighdy against both sides of the stock. A nice feature of this type of gauge is that the centerline remains true even if the stock changes in width along its length. 20 in./4 = 5 in. Now mark the centerhnes ofthe outside slats at 5 in. less halfthe width ofa slat (IX in. ), or 3X in. from the post. Mark the centerline oflhe middle slat at 5 in. from the centerhnes oflhe two outside slats. 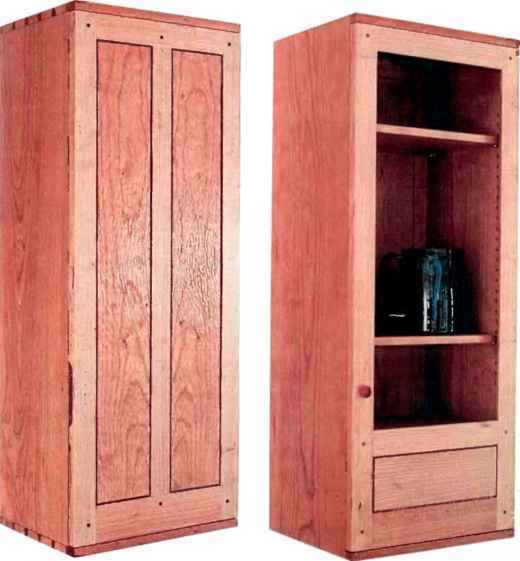 JIM TOLPIN is a writer and woodworker in Port Townsend. Wash.